Juicing celery benefits weight loss and health, to effectively improve your digestion and immune system. Celery was originally used for medicinal purposes to purify the blood. No calories and high in fiber, celery juice is a stimulating tonic and a great addition to a healthy eating diet. Celery and celeriac juice is traditionally used for: asthma, constipation, fever, fluid retention, gout, headache, inflammation, insomnia, kidneys, liver, lungs, migraine, nervous problems and weight loss. 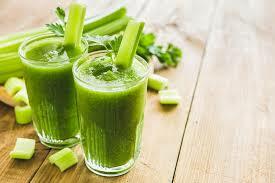 Fresh celery juice has a mild diuretic effect and helps curb the craving for sweets which benefits weight loss. Rich in magnesium and iron content, with up to 95% water, fresh celery juice provides valuable nourishment for blood cells. Juicing celery will provide a good source of potassium, which is great for a hydrated and healthy skin. A major benefit in consuming celery juice is that it also helps to regulate blood pressure. Vitamin C found in celery helps to support the immune system and is a cold fighter. Fresh celery contains cancer-fighting compounds that detoxify pollutants including cigarette smoke. Common salt or inorganic sodium chloride is harmful to the body, whereas organic sodium in celery juice is most beneficial. Sodium is called the youth element because it removes acid from the body, reduces stiffness and loosens the muscular skeletal frame. Celery juice is useful for people who have high acidity resulting in calcification and degenerative bones and joints. This harmful accumulation is obtained from the over-indulgence of animal protein, too many grains, refined and concentrated sugars and concentrated starches. The body can benefit from an increased consumption of celery juice which helps to eliminate calcium deposits before they accumulate and cause harm. Drinking one or two glasses of fresh celery juice can benefit people afflicted with nervous disorders and insomnia. Celery juice is a revitalizing brain tonic, enhances memory, and is good for dizziness. Some have even discovered the sobering qualities of raw celery juice as an antidote to alcoholic indulgences. The juice from celery root or celeriac is valued as an appetizer that stimulates digestion. Celeriac juice has an almost immediate beneficial effect on the body when it is sipped. It is amazing how much juice you can extract from these large, hard, dry-looking roots. Ideal in tropical climates, celery juice is a natural coolant and protector in hot weather. A glass of organic celeriac juice will keep you dry and comfortable, while those around you perspire. Great if you enjoy a vigorous workout like I do, celery juice can be used as a natural sports drink to replace valuable fluid and mineral loss due to sweating. The higher the chlorophyll content, the darker is the celery. Use the stalks and green leaves of celery, which contain both sodium and insulin. Only juice firm celery stalks with fresh leaves. Celery can add a refreshing but salty taste to your juice recipes and is best juiced with carrots or apples. The health benefits of juicing celery and celeriac are enormous. Introducing celery juice into your daily diet can not only improve long term health but also encourage weight loss. So get out your juicer and start juicing celery today!